I occasionally get e-mails (and forum posts) asking questions about identifying yeast versus bacteria in microscopy images. I’m just posting this here as an example of what an average yeast looks like compared to an average bacteria. 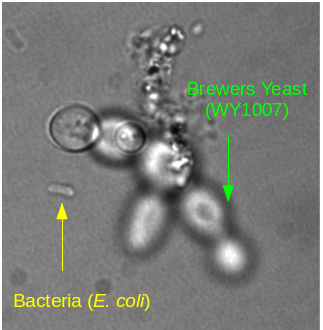 At the top of the image is a cluster of a normal yeast strain – Wyeast 1007 (German ale). They are slightly out-of-focus as I was trying to get the bacteria into focus. At the bottom of the cluster are two budding yeasts, in the middle is another budding yeast which is budding upwards (hence why the small bud is in-focus) and there is a non-budding yeast in the upper-left corner of the cluster. The “strand” extending upwards is a clump of trub. The bacteria is an ‘average’ bacteria (E. coli, which you hopefully will never see in your beer), but which I added to this sample as a comparator. As a rule, bacteria grow faster than yeast under ideal conditions; unfortunately, that doesn't mean much when assessing growth on plates as conditions which are ideal for yeast is likely sub-ideal for bacteria and vice-versa. On plates, individual colonies of the same species generally appear the same and grow at the same rate. The colonies of other species often – but not always – appear different. Generally speaking, if you see more than one distinct type of colonies on your plates (size, shape, time-to-appearance, colour, shininess of the surface, etc) than you have a mixed ferment. However, identifying an organism purely on colony morphology – unless you know what is in the mix already – is not really possible. Humm, do you have some images for comparison of yeast vs bacteria growth… at the plate scale? I have some growth from commercial beers that seem to be of much shorter colony height and slower in growth than regular yeast. If bacteria and yeast are both growing next to each other on a plate, can they be identified as such?